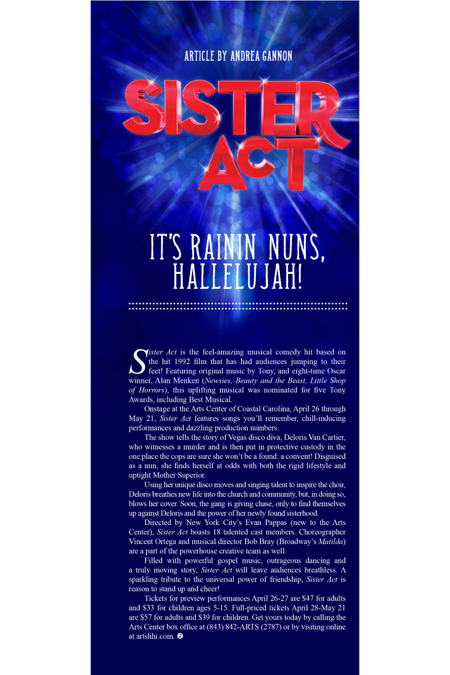 Hilton Head Magazines: CH2/CB2: Sister Act: It’s Rainin’ Nuns, Hallelujah! Sister Act is the feel-amazing musical comedy hit based on the hit 1992 film that has had audiences jumping to their feet! Featuring original music by Tony, and eight-time Oscar winner, Alan Menken (Newsies, Beauty and the Beast, Little Shop of Horrors), this uplifting musical was nominated for five Tony Awards, including Best Musical. Onstage at the Arts Center of Coastal Carolina, April 26 through May 21, Sister Act features songs you’ll remember, chill-inducing performances and dazzling production numbers. The show tells the story of Vegas disco diva, Deloris Van Cartier, who witnesses a murder and is then put in protective custody in the one place the cops are sure she won’t be a found: a convent! Disguised as a nun, she finds herself at odds with both the rigid lifestyle and uptight Mother Superior. Using her unique disco moves and singing talent to inspire the choir, Deloris breathes new life into the church and community, but, in doing so, blows her cover. Soon, the gang is giving chase, only to find themselves up against Deloris and the power of her newly found sisterhood. Directed by New York City’s Evan Pappas (new to the Arts Center), Sister Act boasts 18 talented cast members. Choreographer Vincent Ortega and musical director Bob Bray (Broadway’s Matilda) are a part of the powerhouse creative team as well. Filled with powerful gospel music, outrageous dancing and a truly moving story, Sister Act will leave audiences breathless. A sparkling tribute to the universal power of friendship, Sister Act is reason to stand up and cheer!